The Houston Zoo is one of Houston's best attractions. It holds over 4,500 animals on more than 55 acres of land and is visited by nearly two million people a year — making it one of the most visited zoos in the nation. Here's your guide to the best things to see and do at the Houston Zoo. Giraffe feeding times are a fan favorite at the Houston Zoo. 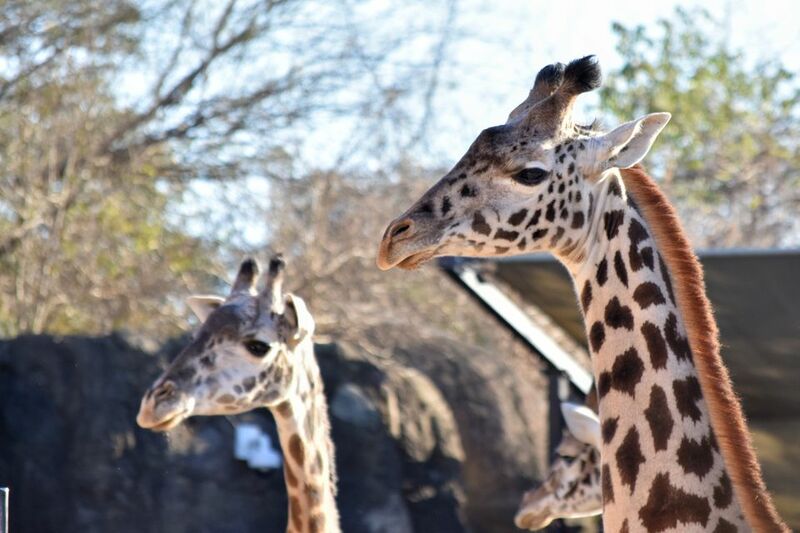 At 11 a.m. and 2 p.m. daily, visitors can go to the Giraffe Feeding Platform and offer up crisp lettuce to the Masai giraffe family as a tasty snack. While on the platform, you can also view the ostriches and zebras that share the giraffes' enclosure. Giraffe feedings cost $7 and are dependent on weather. Tickets can be purchased near the giraffe enclosure, located by the Medical Center Entrance near the southwest part of the zoo. The gorilla enclosure opened in May of 2015 and is now home to seven western lowland gorillas. Like many animals in the zoo, the gorillas have two habitats: one outdoor habitat meant to look and feel like an African forest and one night house with private bedrooms and a 23-foot-tall climbing tree. Visitors do not need to buy separate tickets to see the gorillas. Their habitat is in the African Forest section, located at the back end of the zoo at its southernmost point. Keep an eye out as you wander around the African Forest, and you might see the face or outline of the koolookamba — a mythical creature believed to be half-gorilla and half-ape — hidden in some of the rocks and habitats. Legend has it that this forest creature is responsible for transforming "Gorilla Tommy" (a prominent character in the African Forest exhibit) from a poacher into a protector of the environment. There are 27 hidden in all. Children 18 and under can take items they've found in nature — rocks, clean shells, plant materials, etc. — or that relate to nature like photos or stories from nature journals, and bring them into the zoo's Naturally Wild Swap Shop. There, they can learn more and share information about the items they've brought in, and in turn, they earn points that can be used in exchange for something in the Swap Shop's collection. The Naturally Wild Swap Shop is located in the McGovern Children's Zoo on the west side of the zoo and is open from 9 a.m. to 5 p.m.
During the heat of Houston summers, visitors can cool off by visiting the zoo's more than 13,500 square-foot Kathrine McGovern Water Play Park. The park includes 37 different water features — including a tall "fill and spill" water tree — that are activated when visitors step onto one of the touch sensors. The water park is open April 1 to October 31, from 10 a.m. to 6 p.m., when ambient temperatures are above 70 degrees and when weather permits. Private changing stalls are located at the park, along with a seating area for families, and entrance to the park is free with zoo admission. The water park is located near the giraffe enclosure and Medical Center Entrance on the west side of the zoo. Head over near the entrance to the John P. McGovern Children's Zoo on the west side of the park, and you can't miss the Wildlife Carousel. Many of the hand-carved and colorfully painted animals featured on the carousel are found in the zoo itself, making it a favorite of first-time visitors and long-time members alike. Tickets to ride the carousel are $2 for members and $3 for non-members and can be purchased at the carousel or at the admissions booth. The Houston Zoo is comprised of many different exhibits and facilities. These include the John P. McGovern Children's Zoo, which includes a petting zoo, playground and water play park, the Carruth Natural Encounters Building, Kipp Aquarium, Asian Elephant Habitat, Reptile House and more. Friday through Sunday during the weeks leading up to Halloween, visitors are encouraged to come to the Houston Zoo in full costume and participate in Halloween-related activities. Every year is slightly different, but recent years have featured temporary tattoos, mazes, pumpkin patches and trick-or-treat stations set up throughout the zoo. Zoo Boo takes place in mid-to-late October on Fridays from 9 a.m. to 1 p.m. and from 9 a.m. to 4 p.m. on Saturdays and Sundays. There is no additional cost to participate in Zoo Boo activities; they are included in the price of general admission. During the holiday season, the Houston Zoo is transformed into a winter wonderland complete with holiday tunes, hot cocoa and extravagant lighting. Entrance to Zoo Lights is not included in the cost of regular zoo admission. If you are in a group of twenty of more people, you are eligible for a twenty percent discount on each ticket. You must fill out the Group Tickets Order Form and submit it at least three weeks in advance. For more information, you can email grouptickets@houstonzoo.org or call 713-533-6754. The Houston Zoo is located in the Museum District at Hermann Park. The only day the Houston Zoo is closed is on Christmas Day. Between March 11 and November 4, hours of operation are from 9 a.m. to 7 p.m. From November 5 to March 10, hours of operation are from 9 a.m. to 6 p.m. Admission for children under two are free. Children 2-11 are $14. Adults 12-64 are $18. Seniors 65 and older are $11.50. Admission to the Houston Zoo is free for active members of the military and their families. The Houston Zoo offers free admission on the first Tuesday of every month beginning at 2 p.m. until closing. Members of the Houston Zoo receive free admission to the permanent exhibits year round, and discounted tickets for Zoo Lights. Special or temporary exhibits are $3.95. Visitors can also purchase an All Day Pass, which includes admission to the zoo and unlimited walks through special exhibits for $19.95. You can purchase tickets online by going to the zoo's website. Parking at the Houston Zoo can fill up quickly when the weather is nice and on weekends. Be sure to plan accordingly to ensure you find a spot. Free parking is available throughout Hermann Park, though some locations — such as Lot C located off of Hermann Drive — limit the amount of time your vehicle can be there. Depending on where you are coming from, you could also get to the zoo by using Houston's METRORail and B-cycle bike-share program. To help find your way around the zoo, check out the Houston Zoo map, or download the zoo's app.